Jose, one of the original 1963 animatronic "tiki birds" fetched $375,000 from an undisclosed buyer. Voiced by Wally Boag, Jose co-hosted the lounge's musical review along with Michael, an Irish bird; Pierre, a french bird; and Fritz, a German bird. The four macaws were the first display of Audio-Animatronics paving the way for attractions like the Hall of Presidents and of course, Chuck E. Cheese. A promotional "attraction" poster described as "a scarce variant of the similar 1963 version" gaveled in to a floor bidder at $31,000-well above the $8-10l estimate provided by the auction house. Tiki mugs created by Kevin Kidney and Jody Daily as well as originals by Rolly Crump were also on the block. So were original scripts from the attraction, tiki gods, LP's of the soundtrack, and cast member uniforms. The artifacts were all originally acquired by Richard Kraft. Over 25 years, the Californian amassed what is likely the largest private held collection of Disneyland items in the world. Some of the splashier items include a 40-foot sea serpent from the Submarine Voyage, a 38-foot Davy Crockett Explorer Canoe, a 16-foot-tall neon script "D" from the top of the Disneyland, and, of course, a lot of Enchanted Tiki Room items. Kraft contacted Van Eaton Galleries, an auctioneer known for their Disney sales, about placing his gems on the block to benefit fighting Coffin-Siris Syndrome, a rare genetic disorder afflicting his four-year-old daughter. However, before the hammer, Van Eaton first staged "That's From Disneyland," a two week pop-up exhibition of the massive collection in Sherman Oaks, California. A two day auction commenced on Sunday (8.25). The various lots pulled in millions of dollars in total. 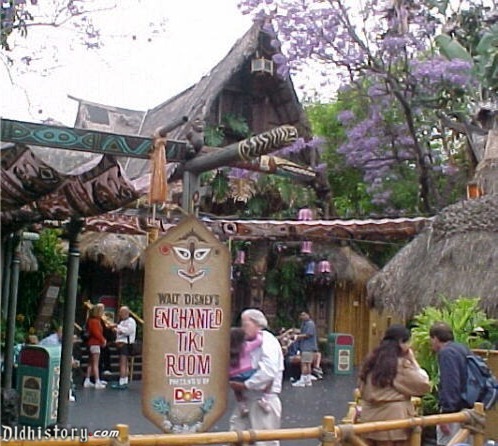 The Enchanted Tiki Room, itself, is also undergoing some changes. The attraction is closed for an indeterminate period while Disney works to make some upgrades. Details are sketchy, but we confirmed that the giant is certainly dealing with asbestos, wheelchair accessibility, and buildout on the connected Tropical Hideaway restaurant.